Fresh from the brand new album Still Alive, The World Isn’t Round introduces Fred Argir’s sound in a blissfully organic and big-band fashion. The track offers up a fairly epic feel from the offset, creative drum work and some powerful chords lay the foundation, then as things build and evolve the songwriting on top of this starts to really shine. As a songwriter, Fred Argir has a deeply thoughtful and notably personal approach – his verses throughout this song present honesty and detail to give off a genuine and real perspective. Furthermore, you can hear the emotion, the passion, in his voice. Though there’s a natural rasp to his tone and performance style anyway, there are certain peaks and lyrical moments of turmoil and longing that are delivered with a particularly poignant dose of heart and soul. This helps it connect in a more profound and lasting manner – particularly if you’re someone who has been through similar struggles. There’s even occasionally a gentleness to Argir’s voice, which contrasts intensely with the weight and flair of the instrumentation – again reinforcing the underlying sentiments and the conflict they bring about. 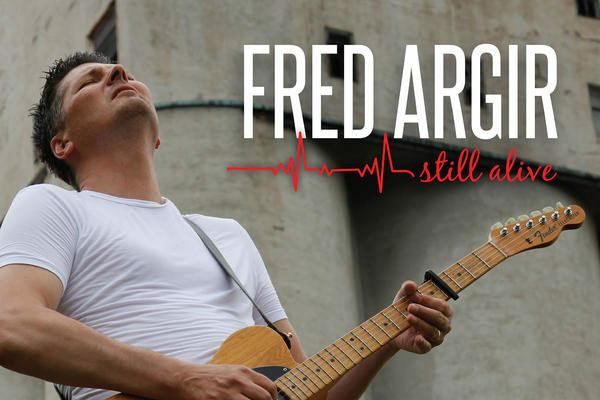 The rest of the Still Alive album sees Fred Argir explore his own thoughts and experiences in an eclectic yet well-rounded manner. The sound is his, dramatic guitars and drums, expressive structures. Meanwhile multiple impressive melodies and riffs help build a sense of variety and offer anthem after anthem of soulful soft rock. You can hear the live aspect quite effectively, the recording is raw and sees the artist and his band caught up in the moment. There’s a lot to connect with, whether it’s a gig you’re looking for or something to escape within – some music that understands you, or that you can relate to – Fred Argir makes for a worthy choice. Find & follow Fred Argir on Facebook or visit his Website.